This past weekend I was lucky enough to jet off for 3 nights in Copenhagen, capital of Denmark. I went with my friend/flatmate as a birthday trip for ourselves, and her birthday landed on the Sunday we were there (while mine is next week!). We got cheap flights out of Edinburgh, and found a room to rent on Airbnb, in Frederiksberg, and our host was nice and offered us some great tips for places to go. This might be quite a long post, as we crammed a lot into a few days, so grab a cuppa and get ready to here about our adventures! By the time we landed and made our way to our flat, there wasn’t a whole lot of time to do much on the first day. We did pick up the ‘Copenhagen Card’ at the airport though, which was around £50 for 72 hours, and included all our transport and a lot of entrance fees for sights. It was definitely good value for money, and if you want to see a few things in the city, I’d highly recommend it. We went out for dinner in the evening though, at a pizza place called Mother, which our host recommended. The pizzas were huge, but excellent! We also wandered around the area of town it was in, Vesterbro, which our host described as the ‘hipster’ part of town. There were lots of cool looking bars, and quirky graffiti and shop fronts to see. We started bright and early with a canal tour, included on the Copenhagen Card. It was a nice way seeing a lot of the main sights in the city, including the Opera House, Royal Danish Playhouse, the Christianshavn region, Nyhavn, and of course, the Little Mermaid statue. She’s a lot smaller in person than most people would expect! We also got a thorough drenching in sea spray on our way back down the harbour, which was a good laugh. 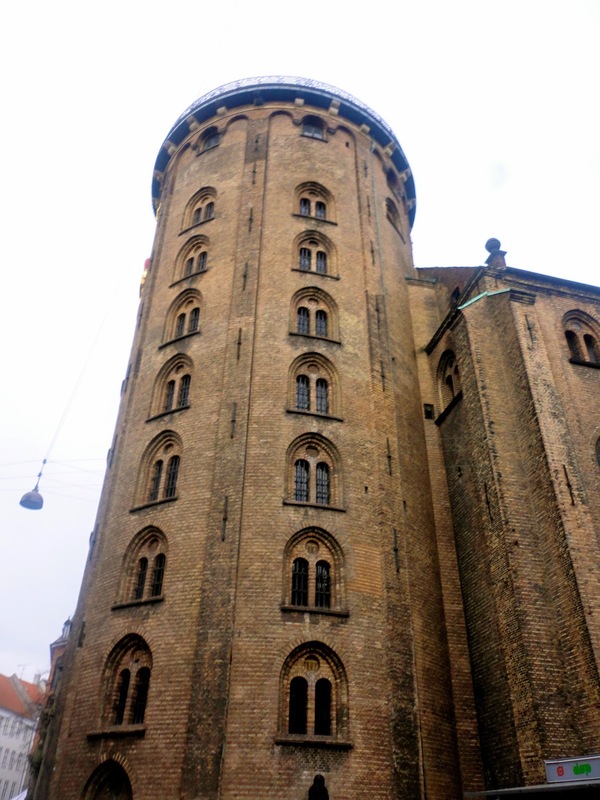 We then headed to the Round Tower, an observatory which the king used to drive his carriage up to look over the city. An easy enough climb for some great views, and luckily the weather cooperated pretty well! We continued our amble through town to Rosenborg Castle. There’s a couple of castles in the city, but we thought this one looked the nicest. It sits in a large park, and is relatively small, but is also home to the Royal Treasury. We spent ages taking photos of the building, before actually venturing inside. I didn’t learn much history (typical me), but it was cool to look around. 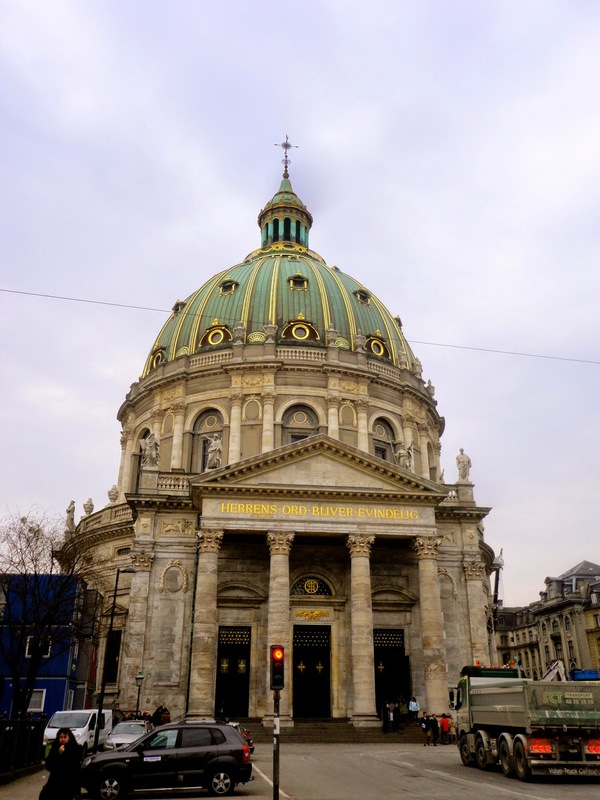 Our wander then took us past the Marble Church, which is stunningly beautiful inside, and Amaliensborg Palace, home of the Danish Royal Family. We didn’t go inside this one, but took plenty of photos around the courtyard, and of the guards, then got a few more snaps looking out across the harbour to the Opera House. We then landed in Nyhavn around lunchtime, so we grabbed hot dogs from one of the many stalls around the city - the red ones are a delicacy everyone has to try in Denmark! We also got churros from a little shop called Rajissimo. Nyhavn is really cute, with all its multi-coloured houses, and definitely one of the prettiest parts of the city. We also popped into the Amber Museum, which had some cool amber sculptures, and a Hans Christian Andersen souvenir shop. We then passed the Royal Danish Theatre and finished our loop back at Christiansborg Palace (where the canal tour had finished), home of the Danish Parliament. Our final stop of the day was the Christiana area, the Freetown, home to quirky art stalls, lots of graffiti, and the city’s green light district; not somewhere your parents would probably approve as it seems a little dodgy, but I loved the atmosphere and felt surprisingly safe. Definitely worth a visit! We finished by taking wander through the shopping streets, getting mostly excited about the Disney store and then the Lego shop. However, most of the shops were similar to what’s back home, and I wasn’t there to do much shopping. We also had dinner at an American diner place called Mad (not exactly local I know! ), which served us some really great burgers, for a fairly decent price. We spent the evening in the flat, because we were pretty exhausted from the day. We then got a discount on the ferry and hopped across the water to spend the afternoon in Sweden! 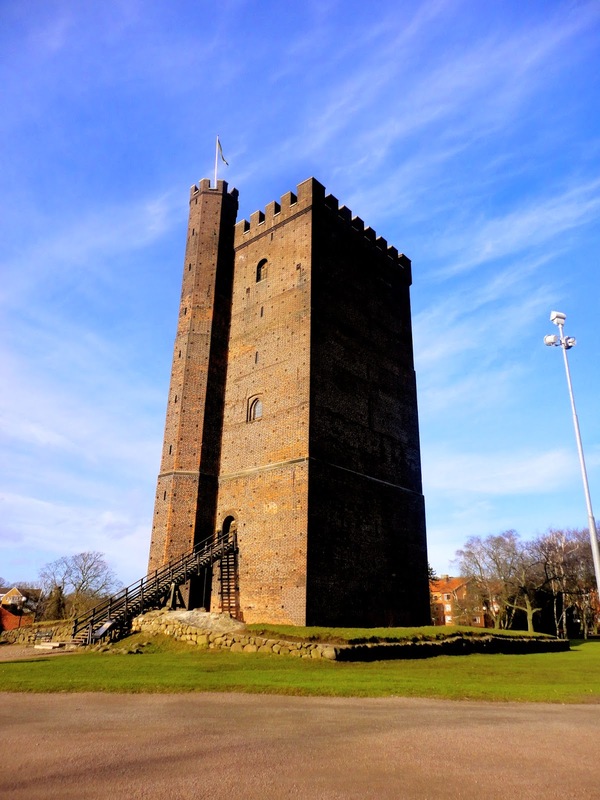 Helsingborg is only a 20 minute journey away, and it’s pretty cool to say you visited another country for an afternoon! We grabbed hot dogs for lunch on the ferry again before landing on the opposite shore. We wandered through the town, heading up the hill for some nice views looking out to sea. We also saw the Karnan tower, and walked down the stairs to the main street. We took a wander through the pedestrian shopping streets and saw the town hall, then grabbed coffee in a really cute little cafe called K & Co, which was lovely. Then it was time to get the ferry, then the train, back to the centre of Copenhagen. We had dinner in our flat that night, accompanied by prosecco we bought in the ferry’s duty free. My friend was turning 21 at midnight, so this was our night to party. We spent several hours pre-drinking and partying in the flat, before heading out to KB18, as recommended by our host. It was pretty small, and not exactly cheap, but if there’s ever a night to spend too much, it’s on your 21st! We drank even more prosecco (among other things) and danced until the wee hours of the morning - definitely a memorable night for me (less so for the birthday girl, who’s missing a couple of hours…), before I led us home stumbling at around 4.30am. Our final day was a bit of a slow start, after our late night, and we were pretty tired all day, but as our flight home wasn’t until the evening, we wanted to try to do something with our last day. We grabbed hot dogs yet again for breakfast/lunch, then went on a public bus adventure to find the aquarium, known as “The Blue Planet”. It’s a very interesting shaped building, and has plenty to see inside - perfect for a chilled out afternoon, with not great weather. I especially liked the sea otters frolicking around (tricky to get good pictures though), and the tunnel inside the biggest tank, home to sharks, rays and a whole host of fish species. By the time we got back to the flat, it was late afternoon and time to pack our bags and say goodbye. My final recommendation though, is the burgers at the Foodmarket in Copenhagen Airport - they were excellent, and definitely what our hangovers needed! All in all, it was a pretty special way to celebrate our birthdays. I love that we got a good mix of sight-seeing, partying, and just exploring a new city. 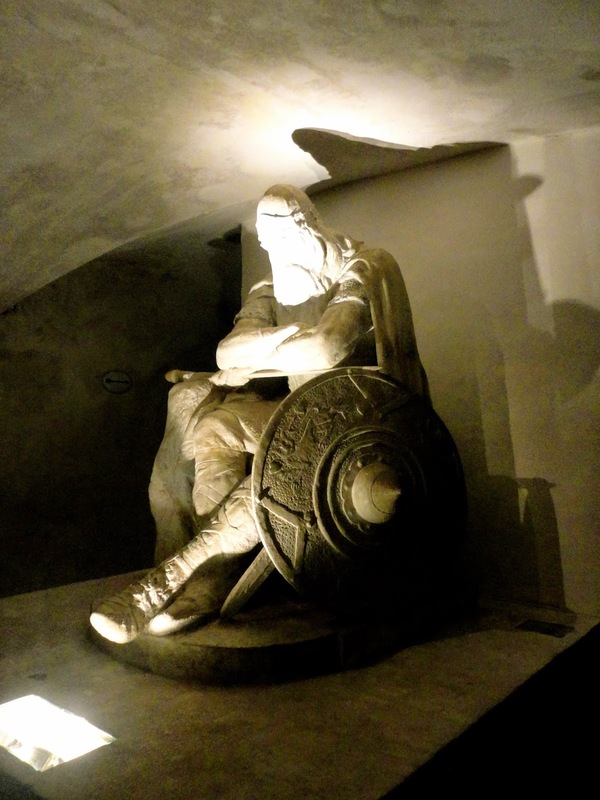 It’s not the cheapest of cities - Scandinavia generally isn’t, but we managed a great trip on a budget, with the Copenhagen Card being well worth its cost. Copenhagen has some lovely sights, quirky neighbourhoods, plenty of stories for the history buffs, and a great choice of bars and restaurants. Definitely worth a visit, whatever your travel style!